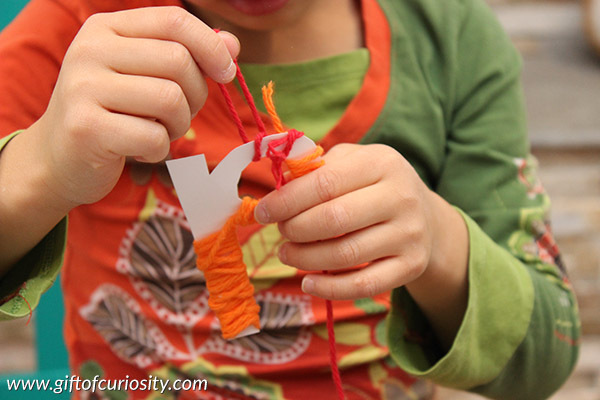 In recent weeks my kids have taken a real interest in using yarn for a variety of purposes. Sometimes they use it to create forts in the backyard. Sometimes they use it to bind my husband’s hands and take him “prisoner.” And sometimes they use it for artistic purposes. 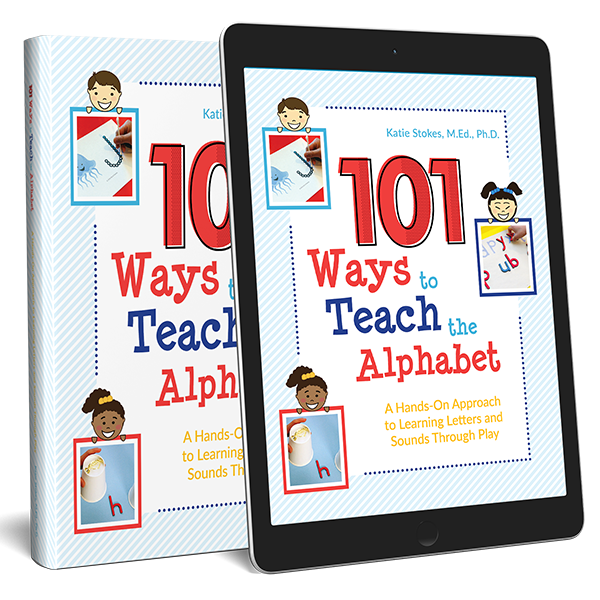 Seeing their interest in yarn gave me an idea to use yarn to help kids learn their letters. 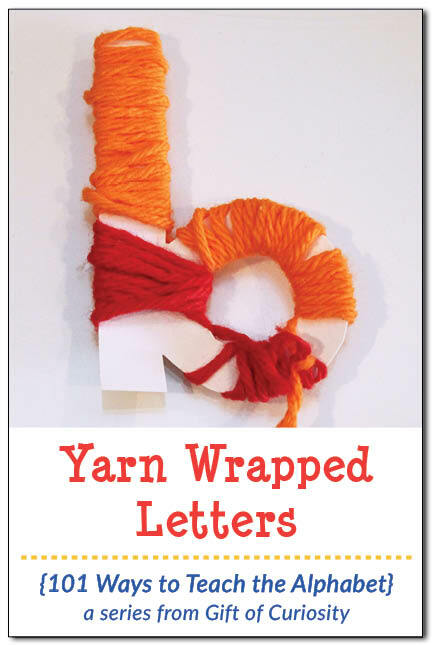 So the next installment in my 101 Ways to Teach the Alphabet Series is yarn wrapped letters, an art project that also supports letter recognition and fine motor skills development. 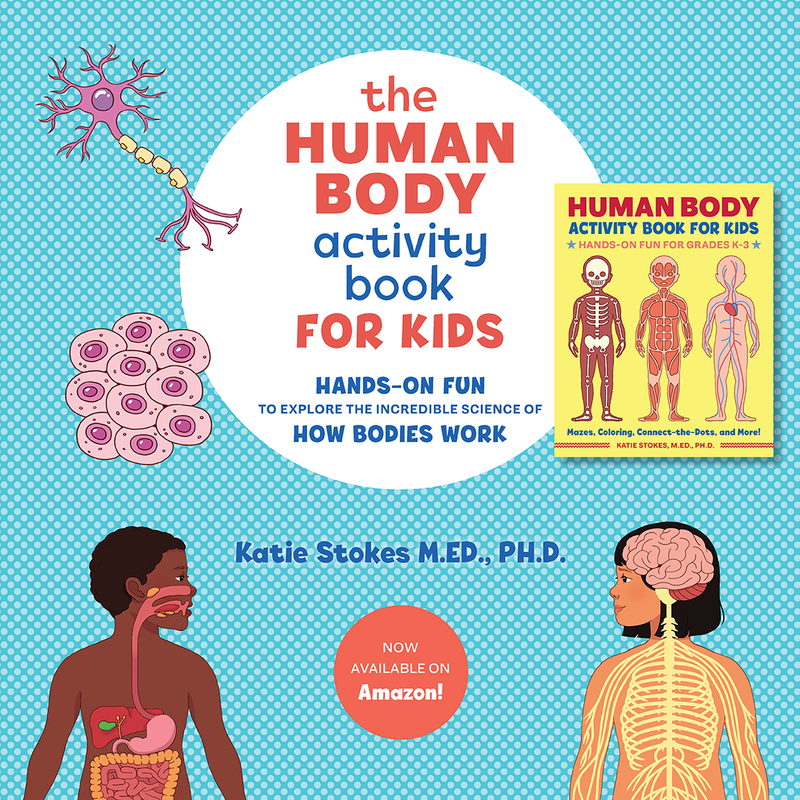 Because my kids have been so into yarn lately, I wasn’t at all surprised when my daughter took to this activity with a great deal of enthusiasm. 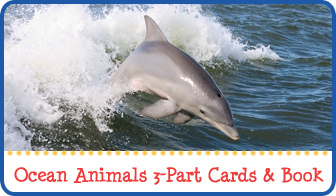 For this activity, I cut letters out of cardstock. 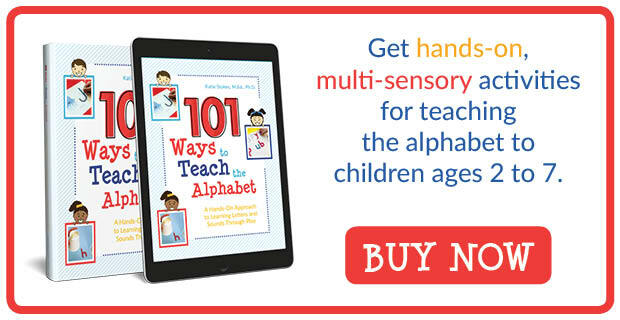 The thicker the cardstock, the sturdier the letters will be and the better they will hold up under the hands of your child. I just free form cut my letters, but if you want help to form the letters you can print my letter outlines on cardstock and cut those. 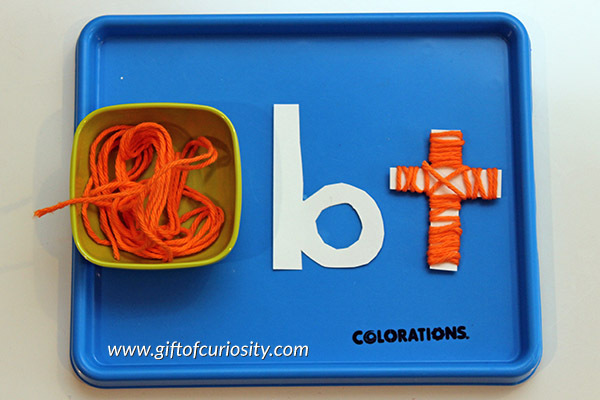 Pair the cut letters with some string and your kids will be good to go! 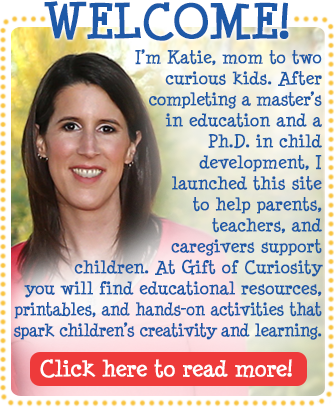 You’ll have to find the right length of yarn for your child. 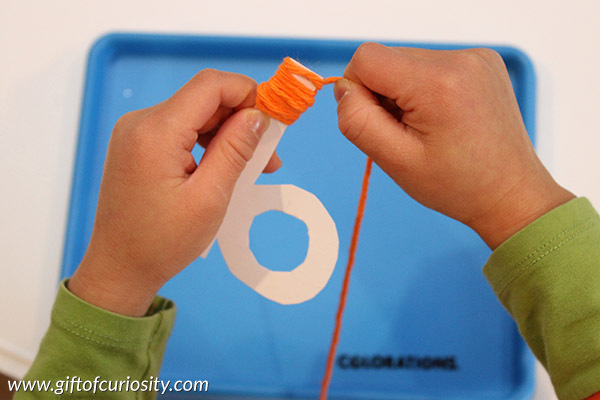 If the yarn is too short your child will run out too many times before they finish wrapping the letter. 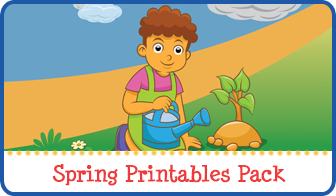 But if the yarn is too long, it will be unwieldy for your child to work with and is more likely to get tangled. I showed XGirl how to wrap the yarn around the letters, and she was hooked. She was really focused on this work. I loved watching her fine motor skills at work. 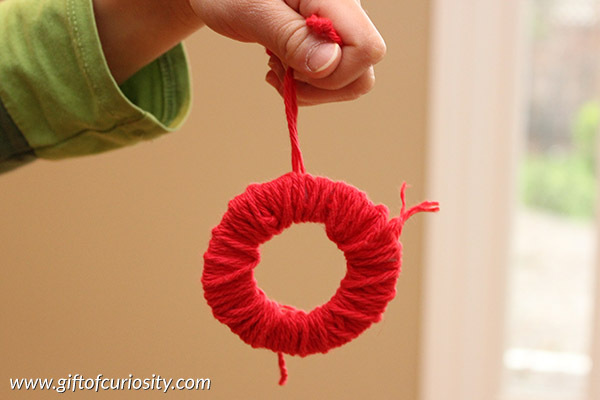 When she ran out of the orange yarn, she wanted to use red yarn to finish her letter. 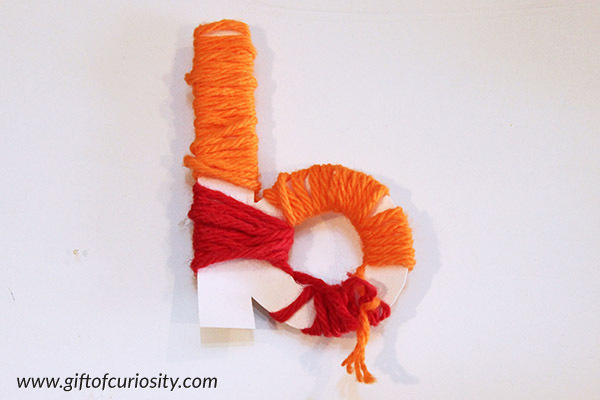 And after wrapping the ‘b’ she was very excited to do more letters. In fact, when she finished wrapping her ‘o’ she decided it looked like a Christmas ornament and she put it on our Christmas tree!